While we know that the wedding day is all about you, we also like to make our guests feel appreciated seeing as they’re there to celebrate you, too! There are so many simple little touches you can add to make your guests feel the love and know that you want them to really enjoy the celebrations. After all, what’s a party if you can’t all enjoy it?! Ladies, we all know that we try to always look our best when we get the chance to dress up for big events. Usually that involves wearing pretty, but not so comfortable, heels. 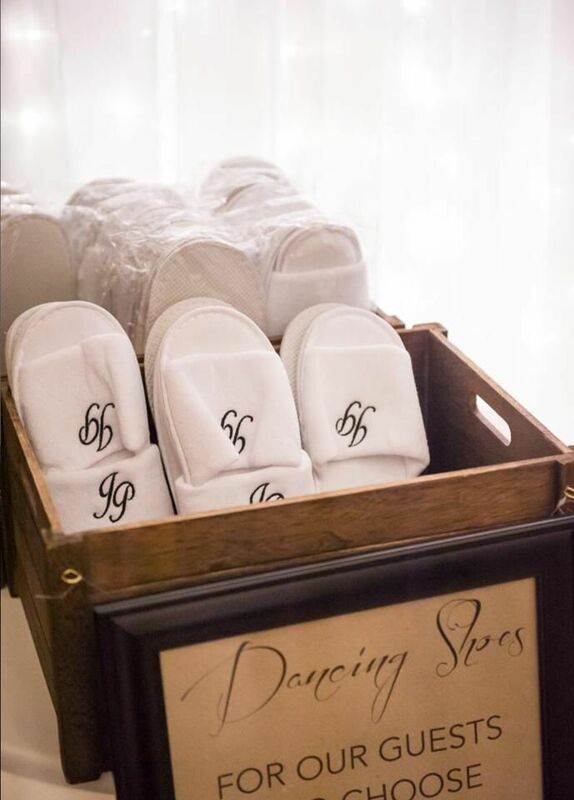 That’s why we love when couples provide a bin filled with flip flops or slippers for their girlfriends to slip into before dancing the night away! Buying in bulk is key and you would be surprised at how cheap you can get these for. It’s also a nice little momento for them to take home and think of you every time they wear them. It’s a commonly known fact that little blips and emergencies pop up throughout events. Luckily, we’re always prepared! We love to put together a little emergency kit in the ladies room for any of said blips. Things like hairspray, hair ties, bobby pins, hair brush, tampons, floss, gum, Advil, deodorant, etc. Not much can fit in those little clutches us girls tend to carry around, so your guests will really appreciate the thought! Your guests took the time to come celebrate your marriage, so it’s nice to return the favor with a small little token to remember the day by. This doesn’t need to be anything expensive or extravagant. If you’re looking for some ideas, make sure to check out our post for some ideas your guests are sure to love! Sometimes, people party a little too hard at weddings. Let’s be honest, it’s pretty common. Hangover kits are a nice little something to send your guests off with, or have readily available at a post-wedding brunch. If you’re on a tighter budget and can’t swing too many extra, hangover kits can make a great favor. Two birds, one stone!